The Doctor, Amy, and Rory are awe-struck by their first sight of Hope Eternal, a super-earth bigger than Earth itself with heavy gravity, volcanoes, and a crust loaded with mineral deposits. But their wonder is cut short when they discover a body dumped on the ground - a huge figure with extraordinarily long arms covered in thick, purple scales. Yet the corpse is not alien: he's human, albeit unlike any human Amy and Rory have ever seen. The Nu-Humans have adapted their genes to fit their new environment, and formed a thriving colony. But now they are facing a terrible threat. Can the Doctor find out who is killing Nu-Humans and why - before he, Amy and Rory are themselves tried for murder? 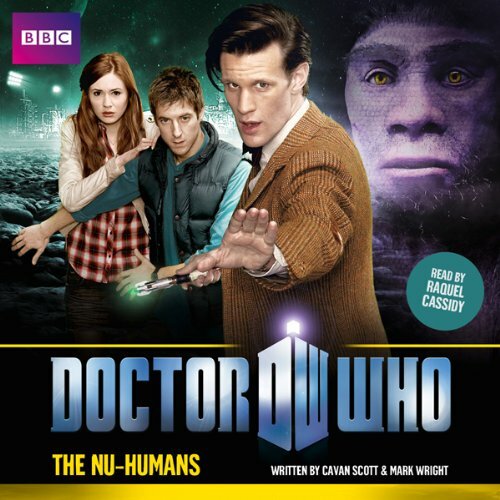 Written specially for audio by Cavan Scott & Mark Wright, The Nu-Humans features the Doctor, Amy, and Rory as played by Matt Smith, Karen Gillan, and Arthur Darvill in the acclaimed hit series from BBC Television. Love a good story with good morales. The performance was good, she did Rory and Amy's voices well. However I kept thinking she was doing David Tennant's version of the Doctor, not Matt Smith. Not a favorite, their was way too much introduction, and it felt like the story was over before it got started. Kind of a letdown plot development anyway. It's hard to squeeze a good story into such a short book, but there are other titles that do it better. Raquel Cassidy isn't a favorite narrator either. I'd say spend your money on some of the other stories first. ok all the way around. Book was ok all the way around. Was good enough that I will try another one.